When it comes to nature, ‘Becoming Big’ is a natural phenomenon of growth. So I often used to wonder why we feel so stressed and pressurized, when it comes to even just ‘Thinking Big’. Being a Creative agency, the team came up with good visuals, designs and layouts. As a Creative head, I wasn’t convinced with their ideas. I expected them to think from a different perspective. I wanted to take their energy to the next level. So a day before the ‘International labor Day’, we sat together and I urged everyone to really think big and act on something which they have never attempted before. The Team was quite excited by this very feeling of doing something for the first time. I suggested an idea and said, “How about creating a real-time impact on a group of people through your action?”. I asked the team to look for labourers while they travel to office the next day. Later meet and greet them with flowers and a water bottle and express your wishes to them. My Intention behind this task was to develop an action-oriented idea and simultaneously make my team think a bit bigger and bolder, yet simpler when it comes to executing ideas. The immediate response from the team to the idea was, “We can’t do this? We have never done this before? How will I do it? What will others think?”. I simply responded by telling them, that a few moments ago they were all excited and curious to do something which they had not done before, but now they fear the same. I said, “This is how we delay our personal growth. By not taking the action, we are actually delaying our ability to grow as a human being and also as a creative person”. With an uncertain feeling of curiosity, my team finally decided to take the idea forward and greet laborers’ along the way. 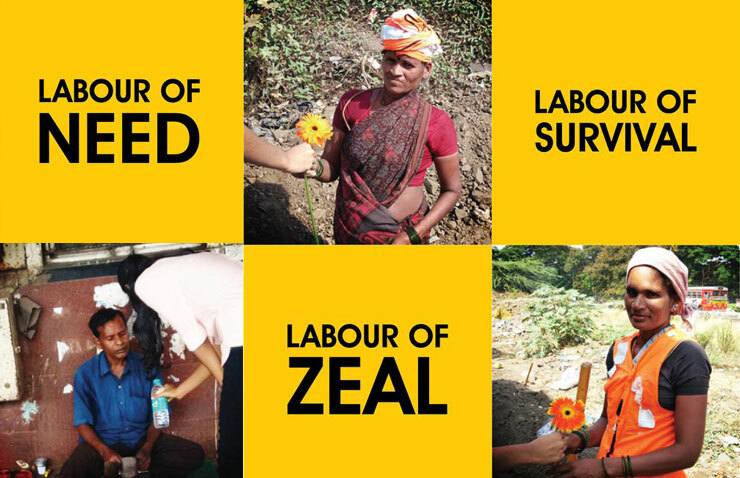 “I felt like a celebrity” “ I felt powerful”, “I felt compassionate”, “ I felt gutsy” , these were the words of the team when they came the next day to office after executing the idea of meeting and greeting the laborers’ on “International Labors day”. Some of the team members could sense the level of confidence that they had instilled in themselves after the activity. A few could relate to the efforts of the labourers while others realized their own ability to make things happen. Friends, here I would like to share an insight which I experienced during the activity: by doing a task, we expand ourselves in terms of our potential, our capabilities, our skills, our responsibilities and our abilities. We actually move in to the next phase of life. This is how nature works during its journey from root to fruit. It grows, expands and becomes large at each phase of its life. Becoming big is a normal part of nature, and also so when it pertains to us. Deepak Nanekar is the Strategy Director of an Award Winning, Mumbai Based Advertising Agency, Golden Mean. He has more than 16 years of experience in building brands and nurturing them to grow. He is known for the deep understanding of Brand advertising and its communication flow through various channels. Does Your ‘Company Name’ Makes A Business Sense? Is Building A ‘Brand Identity’ Important? gmadmin on Is Building A ‘Brand Identity’ Important?